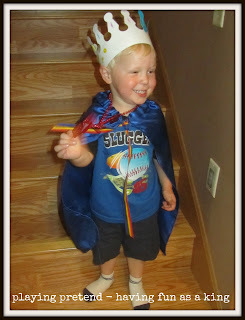 On Friday, he made a crown at Growmobile (a once a week travelling preschool-like program this summer). Much of his pretend play the past few days have been about kings, castles, and all sorts of adventures. He even ran errands with Dad one day dressed in his royal costume (and blue mud boots of course). We've heard some interesting comments and dialog that I wanted to record, mostly for myself. Hope it makes you smile as much as it did me. "These treasures (holding his necklace) say all the rules. This one says 'Don't go outside without the king.' And this is 'Don't go outside if its winter and there is a bear.' The other one is 'Don't go outside, its dangerous.'" "This is my bag of king treasure. Dad, if you pretend to be a robber, you can sneak away the treasure. But don't come in the castle. No robbers in the castle!" "I'm the nice king. I don't steal treasure now. Mom is the queen. Dad, you're the waiter and Ratchet is the mayor. Its my job to lock all the doors and trade food. Dad, please come to the castle tower in my room so you can waiter all the food to people."